How to perform substitutions in volleyball. Each team is allowed a total of 12 subs per set. After administering the 9th sub, the second referee indicates to the coach or captain that 9 subs have been used. Signal by showing the sub signal and then holding 5 fingers on the right hand and 4 on the left hand. After checking with the scorekeeper, get in position and hand signal to notify the first referee in the same manner. Once the court is ready to play, give the ready signal to the first referee. For the 10th sub, the signal is a right hand fist. For the 11th sub, indicate with a right fist and index finger of the left hand. For the 12th sub, indicate with a right fist and the index and pointer fingers of the left hand. Remember, it's appropriate to let the coach know the number of subs taken any time he or she asks. There are certain situations where it's alright for a coach to request a verbal substitution. A sub is allowed for a verbal request when requesting a sub before the start of the set. If an injury occurs during the match and the injured player isn't able to continue to play, the coach or captain may verbally request a sub for the injured player. A verbal request will also be acknowledged after an expulsion or disqualification of a player. There are instances where a request for a time out or sub will be denied. 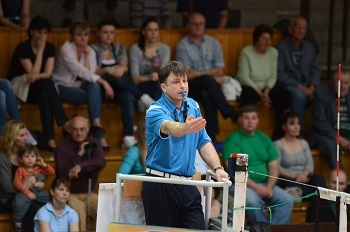 If a coach or captain requests a time out or a sub enters the sub zone after the beckon for service has occurred, the second referee should wave off the request. At the end of the ensuing rally, make sure an improper request is noted on the score sheet. If the time out or sub request causes a disruption to the server or either team or is whistled by the second referee, the team will receive a delay sanction which is immediately noted on the score sheet. If there is a delay in completing a sub, a delay sanction will be accessed. An example of a delay is the sub entering the sub zone and the coach or captain says they don't want to have a sub at this time. Instead of telling the sub they must enter the court, the first referee gives a delay sanction. If the second referee whistles before the substitute enters the sub zone, no delay sanction will be given because no request for sub was made. Remember, a sub request can only be made when the sub enters the sub zone. If a coach or captain verbally requests a sub, this doesn't result in a delay sanction. The second referee should encourage the coach to have a player enter the sub zone. If a coach or captain continues to make verbal requests for volleyball substitutions after many warnings, it may be necessary to assess a delay sanction.